1 x Throwing Parachute Toy. Imitate the landing principle of the real parachute, it landing slowly. Improve children's manipulative ability, bringing more fun, the perfect gift for your children. Material: cloth,plastic. Note:Random delivery Features: 100% brand new and high quality Imitate the landing principle of the real parachute, it landing slowly. It's good for children to develop their intelligence Improve children's manipulative ability, bringing more fun, the perfect gift for your children. Material: cloth,plastic Parachute Size:45cm(diameter) Model of man:10cm(height) Suitable for:3 years old Package includes: 1 x Throwing Parachute Toy . 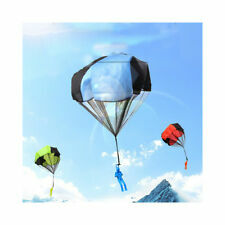 Features: 100% brand new and high quality Imitate the landing principle of the real parachute, it landing slowly. It's good for children to develop their intelligence Improve children's manipulative ability, bringing more fun, the perfect gift for your children. Material: cloth,plastic Color: random color(Default color Blue;if you would like the yellow,please leave a paypal message) Parachute Size:45cm(diameter) Model of man:10cm(height) Suitable for:3 years old Package includes: 1 x Throwing Parachute Toy Note:. 1 x Throwing Parachute Toy. Imitate the landing principle of the real parachute, it landing slowly. Not refurbished, factory seconds, or replica products. Improve children's manipulative ability, bringing more fun, the perfect gift for your children. Color: As the picture shown. Rate (item arrived). 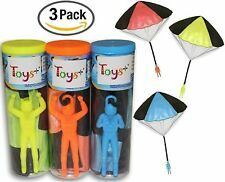 Hand Throwing kids mini play parachute toy soldier Outdoor sports Children's Educational Toys. 1 x Throwing Parachute Toy(Random Color). Imitate the landing principle of the real parachute, it landing slowly. 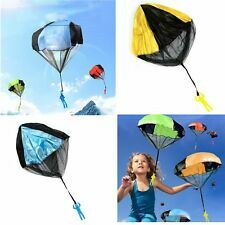 Hand Throwing kids mini play parachute toy soldier Outdoor sports Children's Educational Toys. 1 x Throwing Parachute Toy. Imitate the landing principle of the real parachute, it landing slowly. Improve children's manipulative ability, bringing more fun, the perfect gift for your children. Trending at C $1.83eBay determines this price through a machine-learned model of the product's sale prices within the last 90 days. Roll the parachute up, throw the parachute high, and watch it falling down slowly, help to train the obversation&hands-on experience of children. ● 1 Parachute. Usage: Outdoor toy for child 3 years old. Features: 100% brand new and high quality Imitate the landing principle of the real parachute, it landing slowly. It's good for children to develop their intelligence Improve children's manipulative ability, bringing more fun, the perfect gift for your children. Material: cloth,plastic Color: random color Parachute Size:45cm(diameter) Model of man:10cm(height) Suitable for:3 years old Color：Blue Package includes: 1 x Throwing Parachute Toy Note: Please allow slight 1-3cm difference due to manual measurement and a little color variation for different display setting.. This is the popular kids outdoor team playing toy. Suitable for nursery school and junior school teachers to organize activities with little kids. 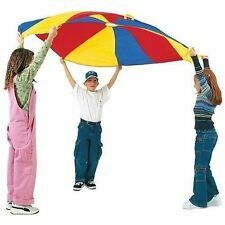 The play parachute is made of oxford fabric, good tenacity and durable to use. 2PCS Kite Surf Toys. Material: Safe Eco- friendly ABS. Due to the difference between different monitors, the picture may not reflect the actual color of the item. Quantity: 2PCS. 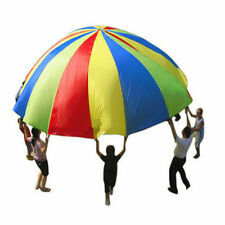 Included: 1 X Rainbow Umbrella Parachute Toy. Design: Rainbow Umbrella. Suitable for training children's coordination and sensory integration capabilities. Material: Cloth. Age Range: > 3 years old. If item is defective after 3 months, you can still send it back to us. Made of high qualtiy material, the parachute toy is durable and long lasting use. The parachute has no strings to tangle, no batteries to replace and no assembly required. You can just simply toss it high and watch it fly. Color: send by random. We will do our best to solve your problem. 1 x Throwing Parachute Toy. Imitate the landing principle of the real parachute, it landing slowly. Material: cloth,plastic. Improve children's manipulative ability, bringing more fun, the perfect gift for your children. 1 x Rainbow Parachute. Let this colorful play parachute bring you fun. 4m/ 13.12ft. Great for indoor or outdoor play. Encourages cooperative play while building upper-body strength. We will try our best to reduce the risk of the custom duties. 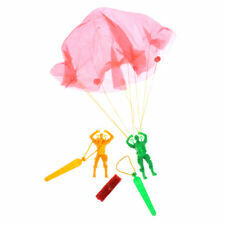 Bring back childhood fun with this colourful parachute toy! 1 x 3.5m Play Parachute. You will get response within 24 hours. We are very glad to help you. These kids doesn't have very strong arms or finger muscles. It will also develop their interest about sports. 1 Umbrella Rainbow Toy. It's very suitable for kindergarten children's outdoor playing or parents who have their baby over 12 months, can have early education training on their kids. 100% brand new and high quality Imitate the landing principle of the real parachute, it landing slowly. It's good for children to develop their intelligence Improve children's manipulative ability, bringing more fun, the perfect gift for your children. Material: cloth,plastic Color: random color Parachute Size:45cm(diameter) Model of man:10cm(height) Suitable for:3 years old Package includes: 1 x Throwing Parachute Toy. And the rainbow color just like the rainbow after the rain. Easily take the parachute from the provided carry-bag and enjoy great fun! 1 x Rainbow Parachute. We will solve your problem as soon as possible. 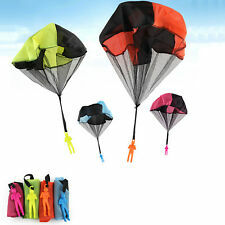 4 x Throwing Parachute Toy. Material: cloth, plastic. We don't collect your financial information. If you don not remark the color, we will send you both the four color. Suitable for: 3 years old. 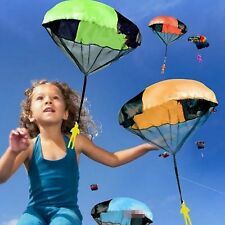 NEW 20 FOOT KIDS PLAY PARACHUTE Outdoor Game-Exercise!! No-rip Polyester with Reinforced Edges! FREE SHIPPING! And the rainbow color just like the rainbow after the rain. 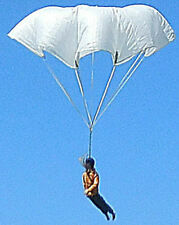 Easily take the parachute from the provided carry-bag and enjoy great fun! 1 x Rainbow Parachute. Sincerely hope that you can understand! 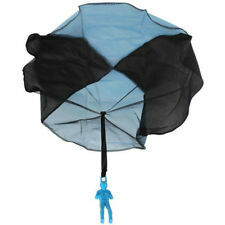 1 Star Moon Umbrella Parachute. Baby sits under the Star Moon umbrella, teachers rotate the Star Moon umbrella orderly, let the children catch in the umbrella Features. How to play: let children be in the middle of the umbrella parents and teacher raise and rotate the rainbow umbrella together. Roll the parachute up, throw the parachute high, and watch it falling down slowly, help to train the obversation&hands-on experience of children. 2 piece Parachute Toy. - Usage: Outdoor toy for child 3 years old. 220lb x 65ft x 2 Dyneema Line for Dual Line Power Kite. Size: 100kg x 20m x 2 / 220lb x 65ft x 2. Material: Dyneema Line. Imitate the landing principle of the real parachute, it landing slowly. Improve children's manipulative ability, bringing more fun, the perfect gift for your children. Material: cloth,plastic. Parachute Man- Tangle Free With Launcher Container! Color may Vary. Roll the parachute up, throw the parachute high, and watch it falling down slowly, help to train the obversation&hands-on experience of children. 1 Fuchsia Parachute. 1 Fluorescent Green Parachute. Roll the parachute up, throw the parachute high, and watch it falling down slowly, help to train the obversation&hands-on experience of children. 1 Parachute. Very good gift for your kids, children. Made of high quality material, the parachute toy is durable and long lasting use. The parachute has no strings to tangle, no batteries to replace and no assembly required. You can just simply toss it high and watch it fly.